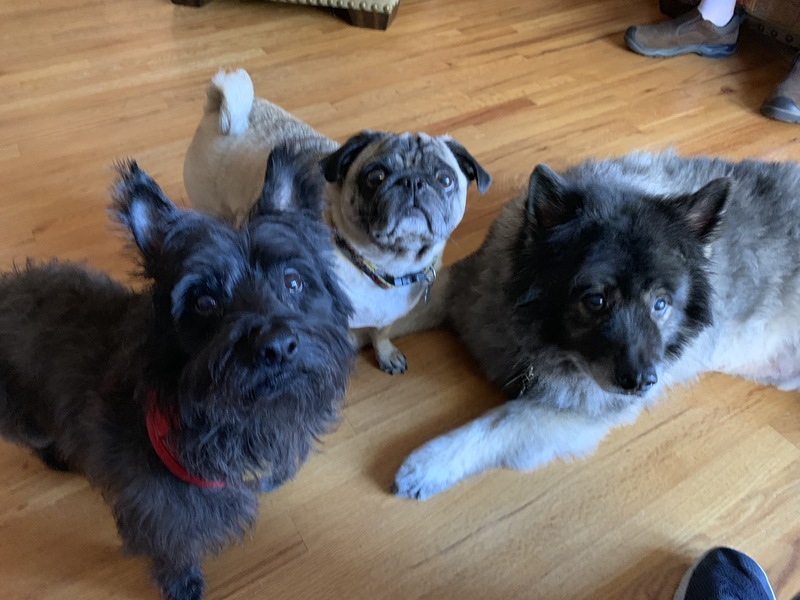 For this Omaha dog training session, we helped 9 year-old Carin Terrier Bear (pictured here on the left with his roomies Frankie and Loki) get over his resistance to putting a collar on and shared tips to stop him from pulling on the leash on walks. Bear was a little mouthy during the session, but this was not at all surprising as he is a puppy mill survivor. Dogs in this horrible places have so little positive interactions with humans, they often have a plethora of unwanted behavior issues. I spent quite a bit of time sharing dog behavior tips and secrets to help the humans better understand their dogs. I showed them how to add structure by petting with a purpose, reinforcing desired behaviors through passive training, how to introduce and enforce rules as well as ways to use body language to disagree with unwanted behaviors. One of Bear’s issues was he did not like having his collar put on. This is another consequence of growing up in a puppy mill. Fortunately, I learned a dog behavior secret to fixing a dog who doesn’t like the collar. I handed my camera to the guardian so I could show her how to use a combination of a CER and counterconditioning to stop a dog from resisting having a collar put on. By taking our time, using positive reinforcement and some dog psychology, we were able to get bear to put the collar on by himself. With a little practice, Bear should stop fearing having the collar put on. To help the guardians remember all the dog behavior secrets I shared in this in home dog training session, we filmed a roadmap to success video.